We all love being a winner, right? Who doesn’t want to get something for free or come in first place in a competition? Facebook contests allow you to take advantage of a large user base that has a track record of contest participation. It seems like everyone these days is using Facebook to give something away, but running a successful contest is not as easy as you might think. There are also a lot of rules and guidelines that Facebook has in place for how to do this and if you break the rules, you might end up getting banned. There are also thousands of contests every week that draw little or no response from users. Then there are some people who debate the issue of whether or not Facebook contests are a good marketing tool. In fact, many in the business world seem to be at a crossroads regarding whether or not these contest even work. Critics insist that a contest only attracts contestants; with the Edgerank dynamic and community focus, you need to attract fans that are genuinely interested in engaging with your brand. The truth is that Facebook contests can be used as a positive marketing tactic- but only when they are done correctly. With that in mind, let’s look at some tips on how to run a successful Facebook contest to market your business. 2 Is it a Contest or a Sweepstakes? Your first question should be whether or not you really need a Facebook contest to achieve your goal. Just because everyone else is doing it doesn’t make it right for your needs. To figure this out, first determine what your goal is. Do you want more fans to your fanpage? Do you want to increase brand awareness? Do you want to promote a specific post on your page? You want Facebook users to subscribe to your website? Set your goal and then decide if a Facebook contest is going to help you reach that goal. Then set a plan of action towards reaching this goal. How many people do you want to sign up or enter? How many “likes” would you want to get from the promotion? Will you be willing to pay for Facebook Advertising to help get your contest seen by more people? What other methods will you use to promote the contest? All of this comes in the planning stage. Is it a Contest or a Sweepstakes? One of the most important decisions you need to make is whether or not it is a contest or a sweepstake. Each one of the promotions has their own set of Facebook rules. If you are claiming one is the other, you could get into big trouble with Facebook. Contest – A contest is any giveaway where the winner is determined by a skill or set of skills. For instance, a company who wants to promote a certain tee shirt could have contestants wear their shirts and take a photo. This photo is posted on the fan page. The photo that has the most likes or shares would be considered the winner. Perhaps a company is looking for a new slogan, the person who writes the best slogan would win. Sweepstakes – Sweepstakes do not require any set of skills or user involvement, and is completely random. This means your campaign requires your fans to like or share a photo or post of yours. At the designated time, you choose from those who have done so and choose one as the winner. Nobody has to have any type of skill and all participants can enter equally without regard to age, gender or race. Of course, you do need to be aware of the legal age of sweepstakes contestants in your state in order to stay with the rules of Facebook. Next, it’s very important that you follow the rules, as mentioned above. Facebook has a very extensive list of rules when it comes to contests held on their platform. First, you are not allowed to use a Facebook feature such as the “like” button as a method of entering or voting. Additionally, you have to notify the winner via some other method (email, telephone, snail mail, etc) before officially announcing them as the winner on Facebook. Facebook has dedicated a section of their usage rules to promotions. The guidelines are strictly enforced, and Facebook reserves the right to take down a contest for any reason, so familiarize yourself with all the rules before starting a contest or sweepstakes. One of the biggest rules that Facebook has about contests (and this one makes sense) is that you MUST make it very clear that Facebook is not endorsing you, your product/service or the contest and that they are not sponsoring the giveaway. This removes FB of liability in the contest. 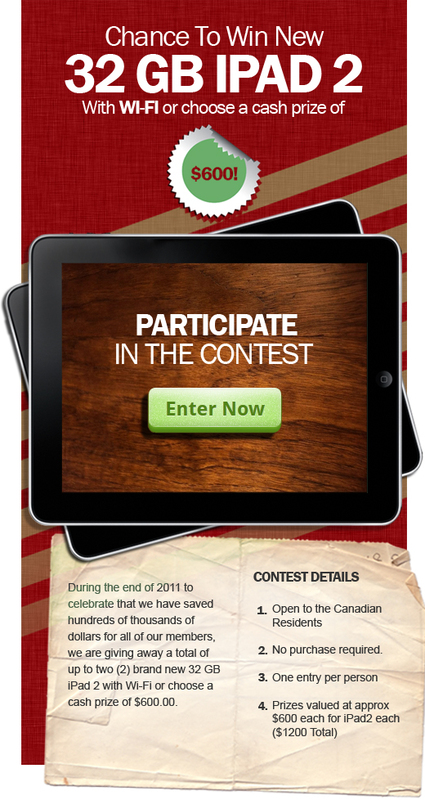 Another rule that they are very strict about with contests is that you use a 3rd party app to hold the contest. A man is only as good as his word, and a Facebook contest is only as good as the company running it. As the creator of a contest, all of your relatives should be ineligible, and the relatives of all parties involved in contest administration should be as well. Design an objective and incorruptible means of deciding a winner. Be as ethical as you possibly can – failure to maintain fairness will almost definitely result in a PR crisis. There have been contests that produce a questionable winner, such as Nissan Australia’s “Micraspotting” contest, which was won by the best friend of a social media staffer that administered the competition. The prize was a $20,000 car, and the ensuing backlash wiped out all the marketing gains that the contest had won. Since Facebook requires businesses to use a third party application to hold the contest, you need to choose the right app for your needs. The truth is, it’s nearly impossible to follow all of their guidelines in a contest without the use of an app (which might have been intentional on FB’s part). There are several high quality app options out there today, but new ones are popping up all the time. Before you pick one do a little research into which one will be best for your unique needs. If your contest idea would require an application that is very expensive, outsourcing the development of a custom app may be a viable alternative. 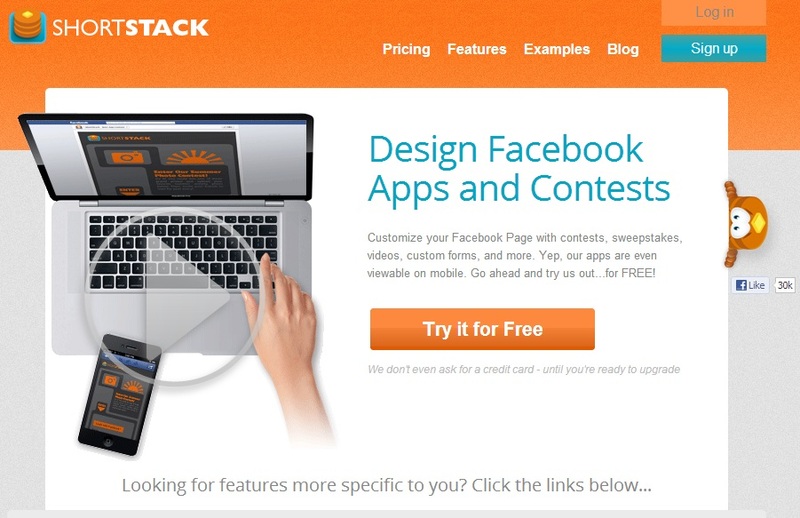 Shortstack is a popular Facebook contest application that offers a freemium tier capable of running Sweepstakes. There are several other pricing options, each with their own set of unique features. Is the price right? What do you get for the price? There are apps out there that range from free to thousands of dollars, so shop around. Is it customizable? If it’s not flexible enough to meet your needs, it’s not going to give the results you want. Is it embeddable or does it only work on Facebook? A good app will let you place the contest on your website and other locations to get even more exposure. Is it mobile friendly? If not, it’s basically worthless. You must have the capability to go mobile with the app to have the greatest reach. Take some time to visit each one, read over what they offer, what it costs and how it works and make the choice of which is best for your specific needs. It’s really up to you but I prefer option number two because this increases brand awareness and shows you are confident in what you have to offer. It gives a sample or a taste of what your business offers and hopefully, the winner will come back for more as well as tell their friends about it. iPads have become synonymous with Facebook contests, to the point where offering an iPad as a sweepstakes prize has become a meme. When it comes to your prize, the most important thing to remember is that the value of the prize should reflect the effort the user has to qualify. Don’t make them jump through hoops just to win your small prize. Overall there will be a strong correlation between the value of the prize and the success of your contest. iPads have become the de facto go to prize for most Facebook contests. They are very desirable, high end, and page owners assume that the majority of Facebook users would like to own an iPad due to an assumed interest in tech gadgets. You may want to offer a hybrid prize that combines your company’s branding with a highly desirable electronic gadget. Also, offering prizes such as company t-shirts for the runner up is a way to increase the perceived value of your contest. Once you’re all set up, it’s time to spread the word about your Facebook contest. The first and most obvious way to do this is with Facebook, but it doesn’t stop there. 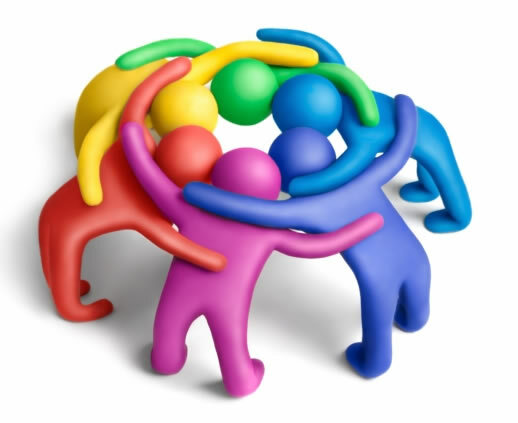 You can share on your website, your Twitter and other social media accounts and even in the offline world if you network and meet people often. You could also do a blog tour, write a press release or use an existing mailing list to tell current subscribers about the contest and ask them to spread the word. The most successful contests have a built in mechanisms that spread the news of entry to a user’s Facebook following. 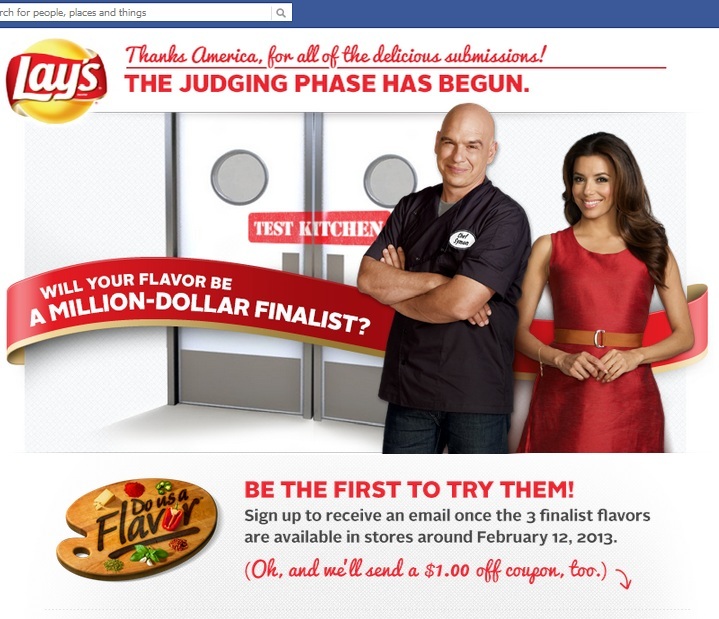 For example, the Lays “Do Us a Flavor” contest let users create wild and imaginative flavor combinations through a Facebook application. When finished, users were urged to share their creations on their Facebook timeline to further promote the contest. The Lays Do Us a Flavor contest was a novel idea that involved user participation, an application that further promoted the contest with each entry, some really outrageous flavors, and a prize that is newsworthy enough to draw the attention of major news outlets. The Lays contest had another marketing tactic at play: the prize becomes a viable news story. With the winner’s flavor suggestion becoming an actual product, hundreds of blogs and news resources will likely report on the contest from the beginning until a winner is announced. When a campaign becomes news itself you know that it was creative enough to serve its purpose. There are also applications that have built in promotional features, such as Wildfire’s Promotions HQ. When you create your contest through the Promotions HQ app, your contest and prize are listed in a searchable directory. The added discoverability could be enough to generate a viral response if your prize is cool enough. Wildfire also operates Sweepstakes HQ and Contests HQ. An alternative to Wildfire’s suite of contest discovery apps is Fanappz. What is the most creative contest you’ve ever seen on Facebook? Have you ever won a Facebook contest or sweepstakes? What questions do you have about launching your own Facebook contest? Wow!! This was one of the most helpful posts about FB ever. Thank you so much! this is good timing, I just had a meeting with a local TV station about this today. There are SO many brands and cheap companies trying to hack their way through social media these days and one place they fail often is contests and sweepstakes. Great post! Lisa, this is a great post for anyone considering running an FB promotion. One of the most successful FB promos we have seen was hosted by Newfoundland & Labrador Tourism and WestJet Airlines. In just one day, they captured 900,000 leads and 7000 likes on FB. It was really well done. Thanks so much for the mention. Thanks so much for mentioning ShortStack in your article! We really appreciate it!